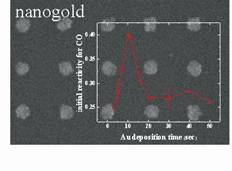 Model catalysts - nanoclusters on supports: We focus our attention on the reactivity of metal nanoparticles which are adsorbed on, for example, metal oxide supports. These topics are related to heterogeneous catalysis and materials science applications. In collaboration with national laboratories, for some of these projects, nanofabrication techniques such as electron beam lithography are used to manufacture the samples. Recently we started to use graphene as a support. The figure below shows a scanning electron microscopy image of a typical sample (made at Argonne National labs and Molecular Foundry in Chicago/Berkeley by S. Cabrini and L. Ocola) and molecular beam scattering data. Nanotubes: We work with carbon nanotubes and inorganic nanotubes mostly towards application in heterogeneous catalysis. 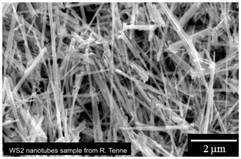 The figure shows a sample of WS2 nanotubes which is used for hydrodesulfurization catalysis. Alkaline earth oxides: These oxides are very reactive for carbon dioxide and alkane activation which we characterize using surface science techniques. Adsorption dynamics: Application of molecular beam scattering techniques to characterize the morphology and reactivity of catalyst surfaces. A molecular beam might be compared with a LASER system, however, instead of monochromatic light we use supersonic and nearly monochromatic particle beams. Adsorption kinetics: Temperature ramping techniques at vacuum conditions and ambient pressure are applied to characterize the kinetics of surface reactions. Spectroscopy: includes a laboratory x-ray photoelectron spectrometer. Stabilization of polar ZnO-surfaces: Validating microscopic models by using CO as a probe molecule, Physical Review Letters 90 (2003) 106102--106102-4, by V. Staemmler, K. Fink, B. Meyer, D. Marx, M. Kunat, S.Gil Girol, U. Burghaus, Ch. Wöll. Internal NASA report NASA/TM-2008 215279, by J. Goering, Shweta Sah, U. Burghaus , K.W. Street, Jr.